Love Live! 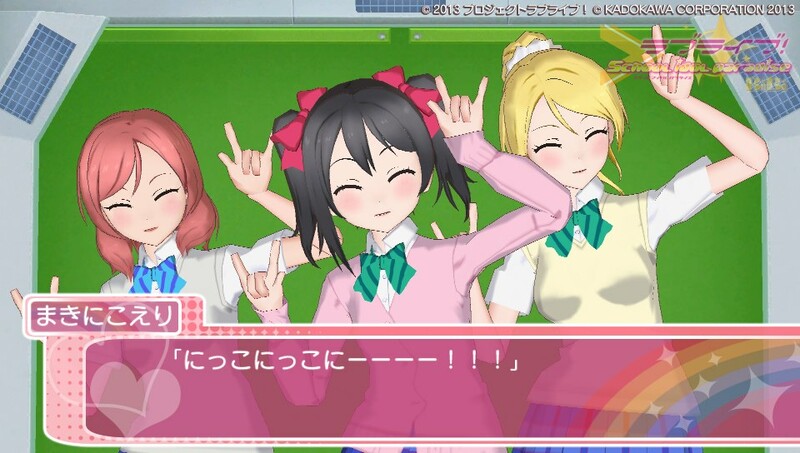 School idol paradise Vol. 2: BiBi Unit - What the fans want from idols is an exciting dreamlike time! You girls are so freaking clueless. I asked him not to do this. I begged him. Made him promise not to give in to the siren call of Love Live! and buy this stupid thing. Did he listen? Did he balls. Anyway, standard stuff about PS Vita coverage, click the screenshots to re-bigulate them and view them at max size. As if that makes a difference. OK, there is one other important note we should make- we foolishly played this game on our English Vita account first. This was partly laziness (switching accounts on a Vita only takes like five minutes but it's such a pain) and partly for preservation (switching accounts on the Vita at this late stage would render our Playstation Mobile purchases unplayable because Sony are incompetent). This means we were unable to play the paltry DLC offerings that were available, the songs Bokura no LIVE Kimi to no LIFE and Snow halation. Whatever they are. He did get to play them about six months after this was published, but they're not significant additions so nobody cares. Oh, and I bloody well bet he's hidden a secret page on here just to spite me. Try and find it, do what you want, I don't care. This is the still-continuing story of how I became the worst Vocaloid fan in th- wait, no, stop. 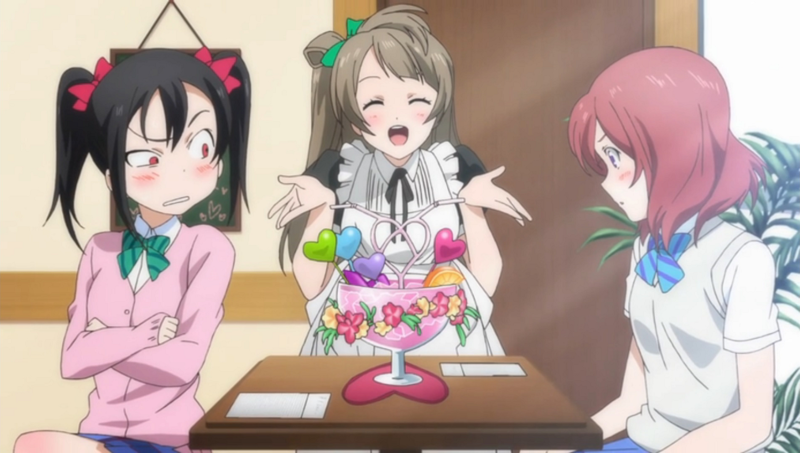 This is, instead, the ongoing story of how there's no escape from Love Live!. And how you're thinking, right now, 'Oh, this is that thing I've seen on Twitter!'. A bit of context is in order, then! If you're the type of person who actually keeps up with this website's updates (you poor, poor fool), you may remember a while ago we had our first (and last) Free-to-Play Rhythm Game Battle Thunderdome in which we pitted Love Live! School idol festival against Groove Coaster Zero. This, believe it or not, served as my proper introduction to the media juggernaut that is Love Live!- a thing about idols trying to protect their school, a bit like Rival Schools with less fisticuffs. 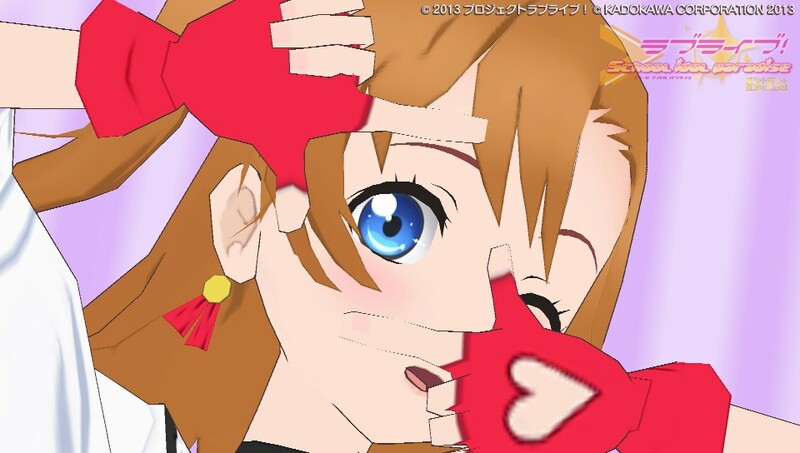 I'm sure at one point this page said it wasn't exactly my cup of tea but that was clearly a fib as I am now knee-deep in 2D idol hell, and while there is a lot to critique about the anime at least (generally it's good when it's going for laughs but tries yanking at the ol' heartstrings too much, you gotta earn that stuff* ) it is a bit silly, and a lot of the ancilliary stuff like the songs themselves are nice and catchy, so I'm down with that. Well, that and recognising Nico as your lord and master. Now, I say my proper introduction, because... Before I played the iOS game- early 2013, to be precise- I knew that there was a Vita rhythm game based on the series incoming. Normally this wouldn't register on my radar, but the developer was Dingo Inc., the developers of the PSP Project DIVA games. Colour me intrigued!... Then it got delayed not once, not twice but three times (it was released September 2014, eventually! The copyright still says 2013 on the title screen!). Not a great sign to most, but considering the poor quality of the footage on show, I was even more interested. This was gonna be a disaster, and I wanted in. I do love a terrible game once in a while! Alas, the game was too expensive at the outset, and the fact it was split into three volumes (because of course it was) put me off further. So, I wouldn't know how bad it was. * Episode 9- Wonder Zone- managed it though. Kotori, you're a good kid. ... Then almost a year later we found the volume we wanted for cheap on eBay. Well, it'd be rude not to, right? Welcome back to Idol Hell! However! 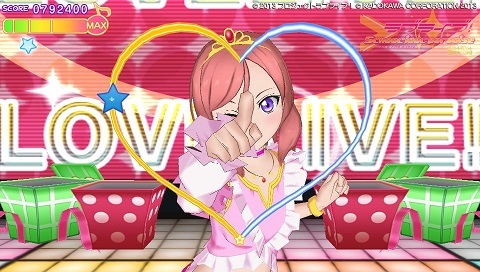 Unlike the other rhythm games we've covered on this site, this one has a story mode! A visual novel-style story mode, no less! It's short- each route is about an hour or two at absolute most- but deviates from the form as your performance in each song determines the path you'll take, rather than any actual choices you make (though there are sub-scenarios that you get to pick between events, some of which have specific requirements, these don't affect your story). 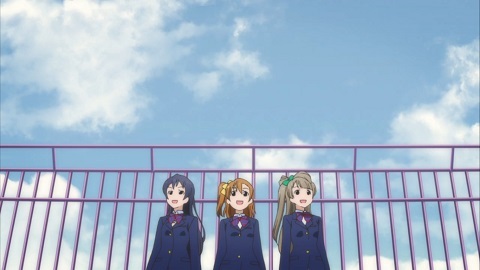 You start your idol journey mucking about on the school's drab stage, do poorly in the songs and you'll get stuck in school for a while before the Akihabara Street Fest, do well and you get to Akihabara early before going to an island for the Love Live, and the ultimate goal is to do well enough to get an encore after the credits and unlock the song made just for this game, Shangri-la Shower. It really is as simple as 'play three songs in a row, get your route determined and repeat until the end' but this is where the bulk of the unlockable costumes and songs are. Outside a Free Play mode, the remaining unlockables are in the Live Mission mode, which have challenges like switching note types and having to end a song with a specific number in the score. Beating these unlocks exclusive remixes and voice clips to listen to in the Club Room (so if you really wanted to hear Maki ask to share an umbrella, your oddly-specific wish is granted) and, well, that's your lot. So that's the structure, but how does the actual rhythm bit work? It's a mishmash of three other portable rhythm games, really- from Project DIVA it takes the idea of notes sort-of swirling in (flower-like symbols appear where the notes spawn from), from The Idolm@ster Shiny Festa it takes the basic control scheme of the left side of the controller being for one note type and the right side for the other and said notes being on a rail, and from, uh, Hyperdimension Neptunia: Producing Perfection (look, I'm as surprised as you that I'm able to use this as a point of reference, but let's just nod and smile and go along with it) it takes the idea of controlling live stage gimmicks/bells and whistles while you play. However, the game is considerably simpler than you might think, as there's no health bar, but a Tension gauge that tells you how you're doing in a song. Use the D-Pad to hit blue star notes, the face buttons to hit red heart notes, and both at the same time for yellow notes, with hold variations of each, and they appear a few at a time on curved rails. As you hit notes, you'll build up red meter for the stage gimmicks which you can set yourself when you pick the backdrop for a song, operate with the right thumbstick, and include lights, bubbles and fireworks. 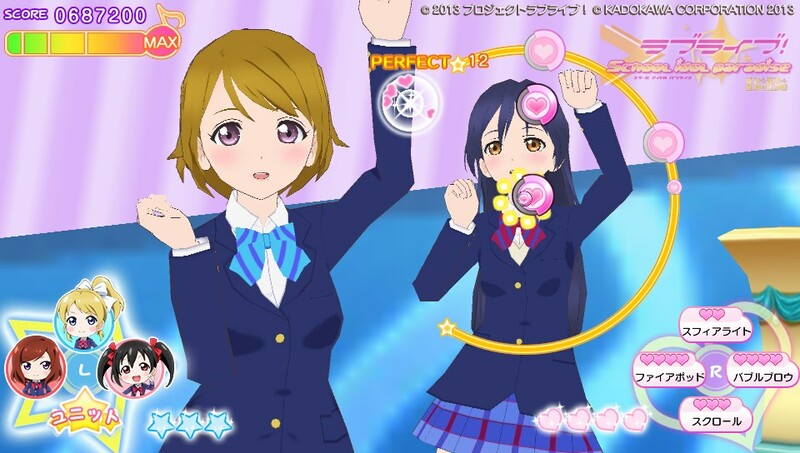 As you set off gimmicks, the blue meter on the left will build up, which lets you do a live feature- one or all three of the idols from your specific version will get up-close to the screen and trace a shape like a heart or musical note, which you trace with your finger on the touch screen. Hit the stars on the shape at the right time and you'll score extra points and build your Tension. Your score at the end is tallied up between rhythm, gimmick and feature points, and... That's it. The weird thing about the rhythm game itself is that there's absolutely no high-stakes here- you can't actually fail. Without the health meter like in almost every other rhythm game ever made, you can literally put the Vita down and score absolutely no points, and the game will still give you a Good ranking (and this advances you in the story, albeit on a lesser path). Obviously that translates into 'you're pretty bad at this' but the fact that there's no pressure dampens the incentive to do well. The Tension bar kinda gauges your performance- it goes down if you miss notes- but it's maxed out far too easily. Additionally, while the gimmicks and live features are a neat idea, they feel like they were thrown in purely to get that idol performance 'feel' to proceedings rather than actively add anything to the game- you can customise stage gimmicks, for instance, but it doesn't feel like it adds much, and doing them mid-song can easily throw you off your rhythm game timing. In particular, the live features actively detract from the game as they stop you playing the rhythm game portion and you have to wait a solid few seconds to start smashing notes again. The game kinda punishes you by giving you a lower score if you avoid them, but if you're just aiming for Perfects, I guess you could leave them out. But in essence, they feel really tacked-on. They don't feel integrated into the rhythm mechanics at all, like you have to play a totally different game for a few seconds. On a technical level there's a few complaints too- the note markers themselves can be slightly difficult to see on certain backgrounds as the colours can blend in and there's no dark outline to clearly separate them from the dance in the background (I almost never had this problem in Project DIVA but it's not as bad here as in Megpoid the Music♯. Fortunately you are free to pick backgrounds so you can avoid ones you struggle with), when you have the full μ's crew in shot the frame rate can drop, and even the note movements aren't always super-smooth, mostly when hold notes show up. Having said that, the game isn't a mess. I'll be honest, I was expecting a disaster on the scale of Puyo Puyo DA! and didn't quite get it. A lot like its iOS cousin, the mechanics feel pleasant enough (even if the gimmicks and live features really don't add anything substantial), it's a little more exciting on the tougher difficulty setting (just the one, accessed by pressing Square on any song in Free Play mode) and, in fact, the game's touch screen mode is actually kinda neat! It's different from what you expect- left side of the screen for blue notes, right for red, rather than tapping the notes themselves- but it works pretty well. It is outclassed by Project DIVA to a massive degree, but it puts up a decent fight. Nah, the main problem is that this game feels like it was kicked out the door, even with its delays. Not to say it feels unfinished exactly, but more like the developers had a couple of interesting ideas and hashed them out quickly, planning to refine them, but Kadokawa Games knocked on the door and told them to hurry it up, and that their budget ran out after getting all the voicework for the game done. 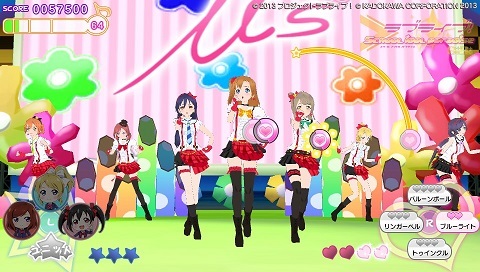 Just to rattle off a few examples, the new remixes of some of the songs are neat but use almost identical note patterns and dance routines to the original versions; missions in Live Mission mode are interesting, like maintaining a certain Tension rating throughout or having inputs reversed but the score-based ones (the majority of them) end as soon as you reach the target (not even letting you finish the song); you can't exit to the title screen during a song in Story Mode; the character models and animations feel a smidgen cheap... And of course, as mentioned the gimmicks and appeals feel tacked-on and not well-integrated. Oh, and content-wise it's thin on the ground- 16 songs (18 with DLC, 5 of those are remixes of other songs on there, 5 are exclusive to each volume, and KiRaKiRa Sensation! is only available to those who bought a CD with a code) when there's way more songs from the series available, and 8 costumes (6 others are locked to merchandise DLC codes!). The one area you can unambiguously say the most work was done was the sound- the entire Story Mode is voiced by the original cast and the songs are shortened but edited in a way you won't notice (this has been a problem in lesser games!). I think the best way to summarise the game is actually the title bar of this page. I don't know how many of you have noticed- you have to actively seek it out on Google Chrome- but every article on this site has a quote either from the game or related materials as the title bar. This one is a line from Nico in the show, about how idols are supposed to deliver an exciting dreamlike time to fans. I picked this out just because it sounded silly, but it applies to this game aptly- it delivers a show to the audience with its stage gimmicks, story mode and their favourite characters, but this isn't a stage show (it's a video game, so I hear) so for the player there's not much to it beyond a slightly-rushed rhythm game. If you're looking for something tough and meaty to scratch that rhythm fever itch, forget it, this won't do it. You're almost certainly better served by anything else, but it's not terrible, I wouldn't say- I have played far worse (hello there, Puyo Puyo DA! and Megpoid the Music♯!) and had a little fun with it for what's there, but there just isn't that much to it in the end. Isn't quite on Miku's level. Not much extra stuff to talk about here, but let's just get this over with. For a start, there's no translation for the game, so if you go for it yourself and want some assistance, then you'll need this Trophy List from PlaystationTrophies, a roadmap for all the Trophies from PS3Imports and the Japanese-language Wiki for the game. Also of assistance to you, due to the fact that these are hidden deep in the Playstation Store, are the links to Bokura no LIVE kimi to no LIFE and Snow halation. 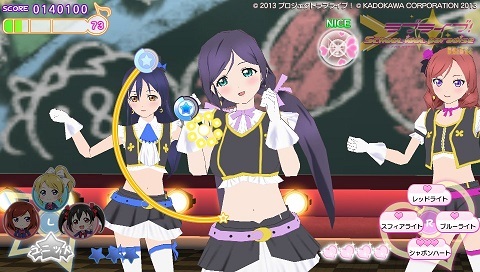 Finally, so you can have a taste of some of the DLC you'll never see, here's all the shop-specific pre-order nonesne (in order, Sofmap, Animate, Gamers Online Shop, Wonder GOO, AmiAmi, Imagine Webshop, Loppi/Lawson/HMV) and here's KiRaKiRa Sensation!, including the correct outfits, even. We hope these resources help you, budding idol producer. Next, you will note that this review focuses solely on Volume 2: BiBi Unit. 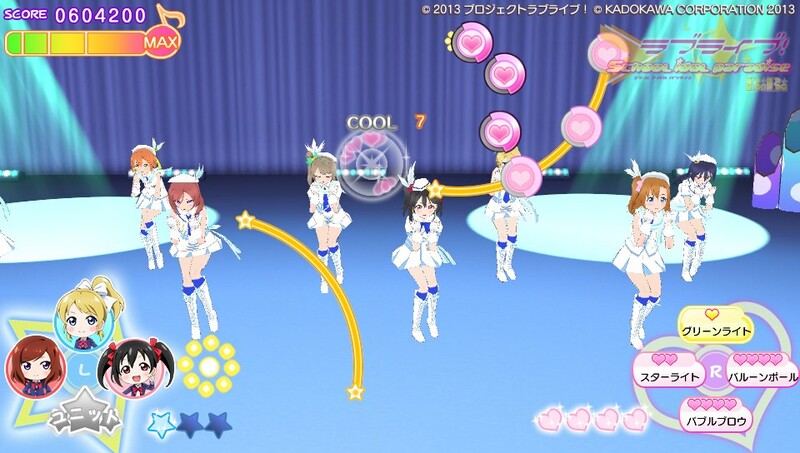 Much like The Idolm@ster: Shiny Festa on PSP and iOS, there's three different volumes of the game, and the one you pick determines which characters you get for the live features, which ones appear in the room mode, and the five extra songs you get (one for each member and two versions of their group song). To give a tiny bit of credit, they are themed after the three units the group were divided into anyway... But it's still pretty expensive to get all three. Volume 1: Printemps Unit has Honoka, Kotori and Hanayo, Volume 2: BiBi Unit (that's ours) has Nico, Maki and Eli, and Volume 3: Lily white Unit has Nozomi, Umi and Rin. 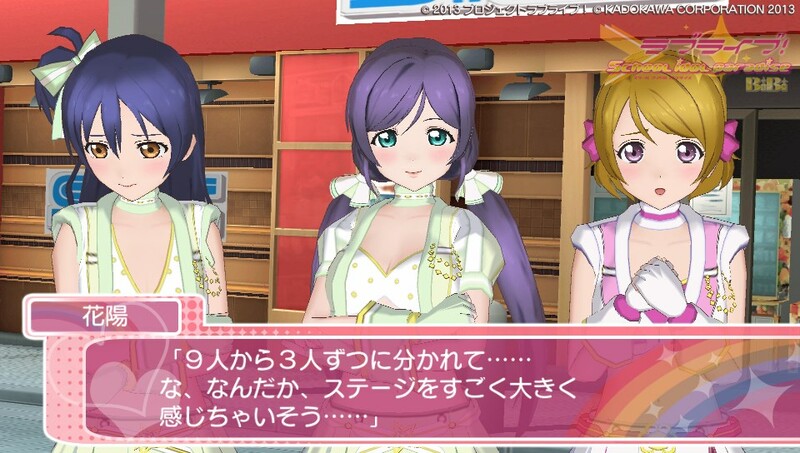 You can also transfer data between the three, as outlined on this page on the Japanese Wiki for the game. By doing so, you unlock 10 Link Missions (exclusive missions in Live Mission mode that unlock new voice clips in the Club Room) for each game you link for a total of 20, and anything you unlock that's shared by all three volumes (storyline routes, sub-scenarios, missions, songs and costumes) in one is automatically unlocked in the other, and characters from the linked volume will appear in the Club Room mode. However, there's no way to have all the characters and all 15 volume-exclusive songs in the one game. So, if you wanna get your Washi Washi on, you must play Volume 3, and to get your Harasho on, it must be Volume 2, and never the twain shall meet. ... So why did we go for BiBi? 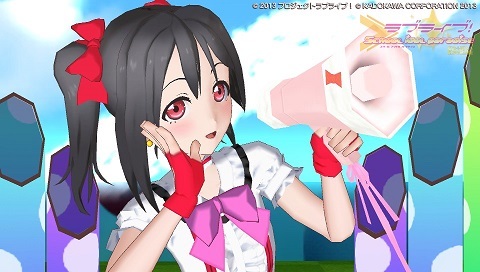 Our research into which of the three versions to get was long and intensive, but in the end, we figured our choices were 'the one without Nico or Maki' (Vol. 1), 'the one with Nico and Maki' (Vol. 2) and 'the one with Rin' (Vol. 3). So, we went with Volume 2. We're not getting the other ones. There we go. 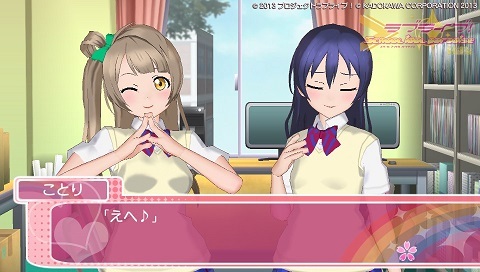 A fitting image to end our Love Live! coverage on. I mean, I'm pretty sure this is gonna be the last time. Unless another Vita game comes out. [Good. May it never darken this place again. Full of the joys of Spring today, aren't you? Come now, you love it really. I know you do. You need to lighten up! Aw, c'mon, get into the spirit of it, eh? "I'm Ed the Editor! I'm a grouch and swear a lot, but I've got a good heart inside! Eddi-eddi-eiiiiii-"
Come and get me. I'm not afraid of you. ... W-wait, put the table lamp down! No weapons! !